It was nice to escape the ridiculous temperatures in Raleigh by heading to the mountains. Even there the temps were higher than normal. Every day was nearly 80 degrees which is really abnormal. My family went up to spend the weekend with the in laws. I really had no agenda. I knew I was going to get on some trout water but I wasn't positive on where exactly. My brother-in-law and I checked out an unknown stream then hit a wild section we almost always fish close to his house. It is always good and it was nice to just wet wade and leave the waders at home. The creek is very scenic and there were plenty of pools like this one. Fly selection doesn't matter much on these streams. Don't get me wrong you can't use just anything. But any humpy, caddis, camparadun style fly in sz14 should do pretty well. I also nymph this creek which my brother-in-law thinks is crazy since the average depth is about 2ft. I find many times it is more productive that dry fishing. I have to use an indicator or my fly will get hit about 40 times before I realize it. Most of these fish average around 6-8inches and they are FAST. They have to be to survive in this tight water. I managed to catch a few up top and a lot more by nymphing. I hooked one fish that was around 11inches. It thought it was 20 and tried to go over a small spill way and into another pool. The fish have a lot of fight in them and they know how to use the current. My goal was to take a lot of scenic pictures of this creek but my camera battery died after a few pictures. This was a common theme all weekend. I figured it was gods way of telling me to stop taking pictures and just enjoy the scenery and fish. Which is exactly what I did. The next day was a family day and on Monday I got a pass to fish in the morning. For some reason again I made my way to a wild creek. 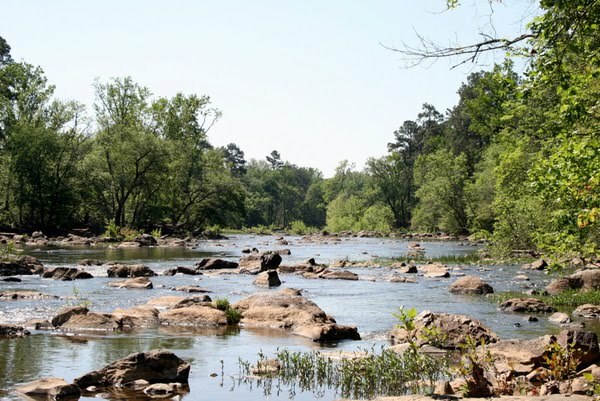 It wasn't really by plan I was going to fish a section I usually love fishing on a near by river but I wanted to check out this creek I have heard about but never fished. The creek follows the road and there were some beautiful sections but the water looked skinny. I wasn't sure if I was in the mood for stealth fishing. I like being able to cast and I'm not a huge fan of duck and cover fishing. It has its place and sometimes I'm all about that. But usually I prefer open space with room to cast and chances at really big fish. I was going to pass on this creek all together but one section really called to me. It was close to the road and I figured it had probably been hammered but it was so pretty I wanted to check it out anyway. I geared up and made my way to the creek. 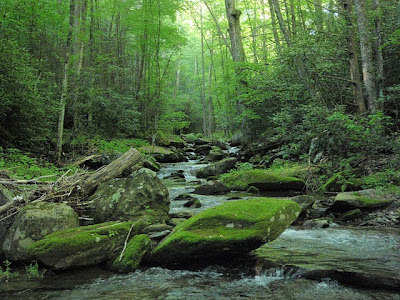 This was by far one of the most beautiful creeks I have seen. Just enough water to hold decent fish and nice plunge pools and cascades that seem to go on forever. There wasn't many foot tracks or trash. I only saw deer tracks which made me even happier. I finally turned the corner and got to the section I was looking for. The picture doesn't do it justice at all. Not even close. The camera is not the greatest point and shoot and it was all I had. In the background you can see the water sliding down the rock and into the pool. I figured it was carrying bugs and fish were just waiting at the edges of the riffles. My guess was right and after missing about 10 hits I finally caught the usual wild fish from water like this. Again the coloring of the actual fish is lost in the picture. The fish had a lot of pink and orange on its under belly. I'm not sure if the fish were spawning but many of them that I caught had a lot of orange on their belly. I did get some bigger fish but again the camera battery died. This was the second camera to do this. I had to spend the rest of the morning enjoying the creek. I could have stayed on this creek all day but I promised my wife I'd be back at a certain time. I wanted to check out one of my favorite spots before I went back. On my way over I ran across this rat snake sunning himself. If you're wondering how I took this picture after just saying my other two cameras had dead batteries, this was taken with my cell phone. I would use the same camera for fish but I tend to drop things in the water. Pliers, flies, weights, nets, reel.... Worried the snake was going to get run over I tapped its tail with my hand. It wasn't really impressed by that and seeing it coiled I went from a big strong oh it's just a snake guy to a scared little wimp. It really frightened me how quick the snake went from being sprawled out to strike position. I knew the snake wasn't poisonous but in my head when I touched its tail I never thought it would defend itself, I figured it would be scared and just slither off. The unpredictable behavior had took me by surprise. I never made it to the spot I was intending to go. I got distracted by some water that looked like it might hold smallmouth. I didn't catch anything but I am blaming it on being the worst time of the day to fish. The sun was high in the sky and the weather was really hot at that point. Well hot for Boone. 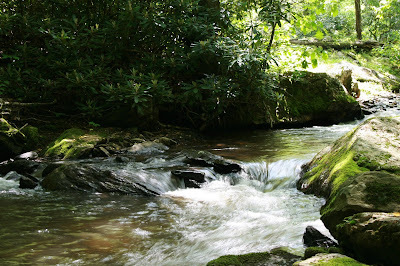 It is nice to have a new creek to add to my list of places I will definitely fish again. I'll also be back to test this smallie spot. I did see a silhouette of a bass but I couldn't tell if it was a largemouth or smallie. Fished with a couple members of Ncangler tonight. We had a great time and many fish were caught. The biggest for me was on the same popper I used to catch a grass carp recently. I think this may be a lucky popper. While hunting bass I found a bed of nice sized gills. They were aggressive but when I'd catch one it would put the others down. I had to wait about 5min before they would get brave enough to hit flies again. I was using a good size foam popper. 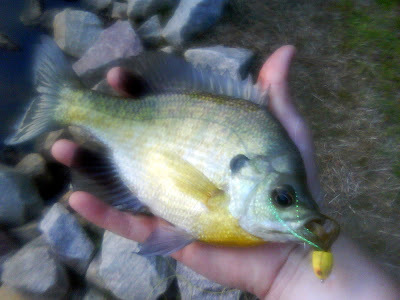 There were smaller sunfish hitting that weren't quite big enough to swallow the popper. Then I came to a bed where a huge shadow charged the popper and slammed it. I jerked the fly out of the fishes mouth on the first take. I wasn't quite sure what just happened. That was either one of the biggest bluegill I have ever seen or my lack of sleep from the new baby is making me see things. The gills were so large they had teeth. It made me think twice about lipping them. Once I found these fish I forgot about bass. I did see a bass chasing fish out of the shallows. I threw a frog popper at it. It charged the fly but I think it figured out something was wrong at the last second. It hit the fly but it just didn't seem right. It seem to stop the strike short. Usually if they want the fly they inhale it. It was fun to watch. The club is working on some custom shirts. These were the most recent. We found a vendor that has special license to David Whitlock's artwork. He is collaborating with us. The shirts look great. I can't wait to show the other designs. The bass were really hungry today. The fishing was quick and nasty. Usually when you fish you hook the fish far out away from you and reel it in. This was the opposite. Many fish were hooked within feet of the bank. Then they'd take off to deeper water. They also were more active when fighting. Jumping several times and making runs for structure. The fish were long but not very fat. Most of the strikes came on a popper fished close to shore. They seemed to like a certain retrieve. I've noticed when fishing for bass at this particular place the closer you can cast to the bank the better. There seemed to be one or two bass every six feet. When they hit it was to destroy. What I found today was they wanted nothing to do with the sunny side of the lake. All the bass were hunkering down on the shady side. There were places where there was only shade because of a tree on the bank. Sure enough bass would be hiding out in the outline of the shade. Waiting to ambush anything going by. What's great about this lake is it teaches you a lot about bass behavior. Which seems to be different every time I visit. I decided to hit a pond by my house after work. Fish can usually be taken with a dry fly or popper. Today was strange in the fact that different sections of the pond fished different ways. The first part I fished the fly had to be left alone. If I twitched it at all it turned the fish off. I was able to hook a few of these guys. I love the bronze belly on these fish. In the second section the fly needed to have some movement. There were bass chasing shad into the shallows. A kingfisher was using this to his advantage. When the fish would scatter the bird would jump right in the mix and pull out a minnow. It was fun to watch. I was moving around the bank where it made kind of a cul-de-sac. I had my line in the water and I was dragging my fly. After a few seconds I heard the sound of a fish hitting the fly. I looked back and saw a swirl near where the fly was. I started to use a quick retrieve with the fly and there were some ferocious strikes. Most of the fish caught were small bass. I fished this way and worked the pond until I was near where I started. I saw a grass carp lingering just under the surface. I've cast to grassies this way before and had them hit poppers but I never could hook them. I first cast the popper way too far out in front of the fish. It didn't move. My next cast was behind the fish and I was sure it was going to spook it. The fish turned and I figured it was over but then it turn around again and held it's original position. My next cast was right on target just ahead of the fish but in the strike zone. I gave the fly a little twitch and the carp started to move. It got closer and closer and it was moving at a pace you see so many times fishing. Where a fish comes up to the fly nonchalantly sips it then keeps going. I couldn't believe my eyes when I saw the carp swim up and engulf the fly. I set the hook and the fish immediately turned and headed for deeper water. Then I remembered I was using a 5wt. I have only used the rod a few times and I wasn't sure exactly how much it could take. This fish looked to be 10lbs. The other issue was the reel. I left my 5wt in another case and in a pinch I grabbed my 4wt reel which has a click paw drag and who knows how old fly line and tippet. I was worried the fish was going to take me to my backing immediately. Luckily with the force of the rod I could turn the fish. It was a good enough amount of pressure but not enough for me to have the upper hand. The fish would come close then bolt back away again. This seemed to happen for an eternity. I walked the bank and tried to get the fish in shallow enough water to bank it. With other carp they always snapped the tipped right when I went to land them. I wasn't sure exactly what size tippet was on my line it had to be old and 5x at the heaviest. I decided to try to snap a pic of the fish figuring the knot would pop anytime. I made an attempt to land the fish similar to a bear trying to paw a salmon on to the shore. The fish just turned and sped off back into the water soaking my pant leg at the same time. It also decided to try to take my pole with it. I grabbed it just in time and then noticed I had an audience. Not a huge crowd just one woman, I had no idea how long she'd been there. I was determined to land the fish not just for her but for my own peace of mind. I decided to either pull the fish in or snap the tippet. A few times I got the fish in and made a swipe for my leader and the fish would flee almost as if it knew what I was doing. I worked the fish for another minute or so then made the final attempt to beach it. I saw the fly right at the edge of the fishes mouth. I pulled on the tippet and the fish came up on the shore surprisingly easy. I realized the fish had more of an advantage in the water than out of it. Once the fish was in the grass I could see it in all of its glory and actually enjoyed the moment. This was by far one of the biggest fish I have ever caught on any rod. I snapped a few pics with my phone and prepared to release the fish. A man came down that I assumed was the womans husband. He looked at me, then looked at the fish and just gave me a thumbs up. It was a funny interaction but somehow for the moment totally appropriate. I released the fish and in my head imagined this must be what releasing a salmon or steelhead is like. The fish swam away slowly and it seemed to have the body language the said "ok, you won.... today." Till we meet again. I hosted a fly fishing trip on the Eno today. The trip was for people new to fly fishing. I think everyone had a great time and even though it doesn't matter, no one was skunked. The water level was perfect and the cicadas were singing like crazy. The sound is a little eerie. It's almost impossible to describe. It sounds alien and the bug looks it as well. Empty husks lined the leaves and edges of trees. If you looked at the ground you could see holes from where the cicads unearthed themselves. After enjoying the scenery we made our way to the water. After removing a few flies from the trees the newbies were getting the hang of it. I was able to branch off and fish on my own some. The sunfish were doing their usual thing smacking top water poppers with a vengeance. They seemed to really like the beetle shape flies which made sense with all the cicadas around. I caught one really beautiful sunfish right off the bat. It was the biggest of the day and I should have gotten a picture but I let it go thinking I'd catch plenty that size. Everyone was catching fish here and there and most of the new people started to create a decent loop. It was a fun day and I hope to get out next weekend. The club is checking out the stretch of stream we are adopting. We're going to take water samples and do some fishing. My buddy told me about a hot spot where there are a bunch of Shell Crackers. I had never caught one in the body of water we discussed so I was eager to check it out. He wasn't kidding! The shell crackers were there and they were BIG! Feisty too. I've decided I hate my Olympus WP550. It takes horrible pictures but great underwater video. Here was the best picture I could muster with it. The lighting wasn't very good but still this is very poor for a modern digital camera. Maybe it was user error. The gills were just as big as the crackers and I had fun just catching fish after fish. They all went after a fly that is basically Chenille and rubber legs. I caught a few bass too. They were mostly close to shore. Inches away to be exact. There were a couple that took some fancy casts. There was a fish in the shade that was the biggest bass I have caught in this lake. I figure the fish was around 3lbs or under. It was a lot fatter than the pic makes it look. Or maybe my brain just wants to remember it that way. This lake is really bipolar. In the late spring early summer you can't find a better place to fish. Any other time of the year the fishing is just ho-hum. I'm not sure what causes that. I don't really care as long as I can enjoy it while it lasts. Tonight was one of those times I live for as a fly fisherman. There is a local pond that at certain times of the year gets ridiculous. Tonight was one of those times. When I arrived I saw some fish activity on the surface but didn't get my hopes up. On my first cast I had a hit and the fish fought hard then came off. On my next cast I hooked up again this fish came to hand. I kept getting hits or catching fish and I ran across a bed of monster sunfish. I think they were spawning. I couldn't get them to hit anything. I tried after them for about 30min which is probably 20min longer than I should have. 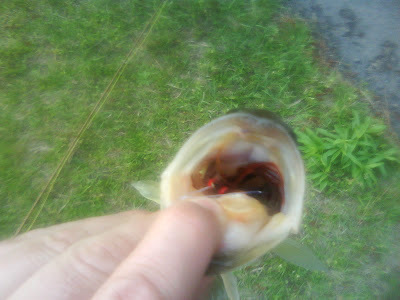 I eventually went back to bass fishing and tied on a crawfish color bass bandit. The action then went crazy. The fish weren't just hitting this fly they were annihilating it. I stopped reaching for the pliers and just kept them in my pocket because every fish was hooked like this. Sorry about the crappy pic it was with my camera phone. My friend showed up and he decided to try his luck on top water. Once he made his way over to where I was fishing he had hook up after hook up. It was unbelievable, I had to switch to a top water fly as well. 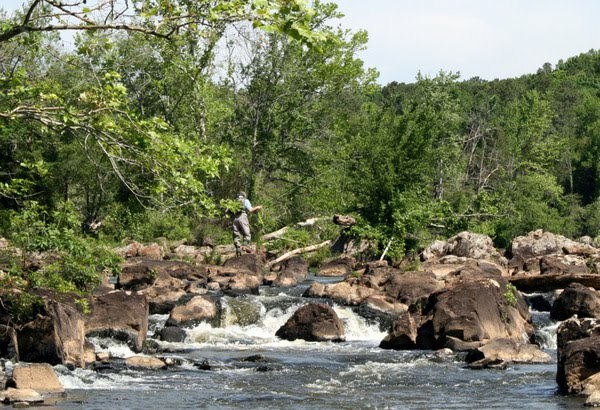 Top water bass fishing is almost as exciting as it can get. You can't predict when a fish is going to strike but it's always when you least expect it. This is usually how it goes, you cast out make a few strips nothing, your fly line is wrapped around your foot, you got to fix it, STRIKE! You make a couple casts get nothing, your friend says something to you and you look over to answer, STRIKE! You cast out notice some movement by you feet, look down and see a 2ft water snake, STRIKE! Bring in some line figure the fly is too close to shore go to lift the line, STRIKE! This is seriously how it was all night. Luckily the water snake part only happened once. We had several doubles and before we left I was able to entice a gill with a top water fly. It was an evening to remember for sure. I remember an anti littering campaign growing up similar to Smokey the Bear. 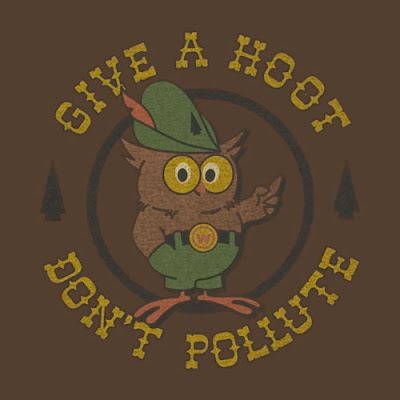 The motto would be "Give a Hoot, Don't Pollute." As silly as it was the message stuck. Littering has always bothered me. Especially when it's blatant disrespect for the environment. 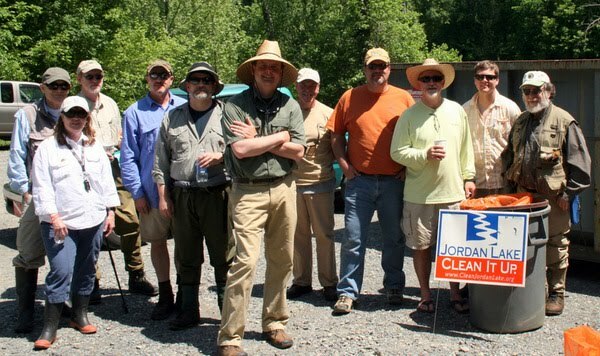 Triangle Fly Fishers has a clean up on the Haw River every year. We were prepared for one of the worst. Recently there has been bad thunderstorms and tornados that have thrashed the area. We all figured trash would be washed down and plastered around the banks. What we found was the opposite. There must have been a clean up done a couple weeks prior to ours. The river banks were the cleanest I had ever seen them. Usually I can walk maybe 50yds and half way fill a trash bag with bottles and other trash. This year I had to literally hunt for trash. Even things as small as gum rappers. I was really pleased at the conditions but also that others are taking the initiative to keep the river clean. It also gave us more time to fish. There is a friendly fishing tourney after the cleanup. Points are awarded for certain species that are caught. That tallied with your trash total weight makes you eligible for a prize. Trash is worth more than fish because after all it is a clean up. So you really want to find as much trash as possible so when you weigh in you have a good amount of points. With the small amount of trash abundant the focus really turned to fishing. A friend who knows the area pretty well broke off with me and told me he knew a hole that always held crappie. After about a half mile walk we came to this section. The rocks on the Haw are treacherous. If you're not careful you can find yourself over your head fast. The terrain varies quickly and current is deceiving. We fished the section for a bit with no luck. There was a pretty good hatch going off of something that looked similar to a caddis. The wings looked a little different than a normal caddis, the color was mottled and when the bug settled it had more of a moth wing pattern than anything. In flight it looked exactly like a caddis. They are on the river but the numbers this day were huge. I saw fish rising to the bugs downstream. I worked my way to where they were feeding and tried the smallest fly I have ever used for the Haw. Usually I fish bass flies, clousers, poppers, and rabbit strip patterns. This time I was going to with a sz14 elk hair caddis. I'm rusty on my drag free drift casts. I figured since these were most likely panfish they wouldn't care. Turned out they did. On my one good drift I had a fish on. The way the current swirled it was hard to get a good drift every time. I decided to try something different. I cast at a 45 degree angle down stream let the fly go under water swing it then near the end give it 2 short strips while retrieving it. This was the ticket. I caught fish after fish this way. I was really targeting white bass or other fish but the sunfish were a good way to just get something. They were the only fish I caught and I probably caught over 10. When we came back and tallied our fish totals no one had caught more than 3 fish. I wasn't too proud of catching only sunfish so I just said I got 6 gills. One guy had gotten 3 white bass so I think he was a shoe in to win the tourney. It was a great day to just be outside. The only bad part was the amount of ticks. This area is known for ticks but this year seemed to be especially bad. I'm kind of glad there wasn't that much trash because I would have been covered if I ahd to off the trail. I saw some of the largest ticks I've ever seen. Ever after going home and changing cloths about 3hrs later I found a tick trying to burrow into my leg. I got it off before the head got in. I hate those things. Over all the day was great and I look forward to our next clean up event.